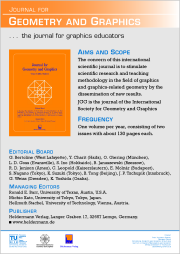 The concern of this international scientific journal is to stimulate scientific research and teaching methodology in the field of graphics and graphics-related geometry by the dissemination of new results. G. Bertoline (West Lafayette), O. Giering (München), L. D. Goss (Evansville), M. Hajja (Irbid), S. Ino (Hokkaido), B. Januszewski (Rzeszow), R. D. Jenison (Ames), C. Leopold (Kaiserslautern), E. Molnár (Budapest), K. Suzuki (Tokyo), B. Tong (Beijing), J. P. Tschupik (Innsbruck), E. Tsutsumi (Tokyo), G. Weiss (Dresden), K. Yoshida (Osaka). Ronald E. Barr, University of Texas, Austin, U.S.A.
Hellmuth Stachel, University of Technology, Vienna, Austria. 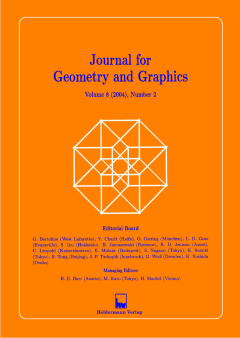 The Journal for Geometry and Graphics is reviewed in Zentralblatt für Mathematik and Mathematical Reviews, indexed by Clarivate Analytics (formerly Thomson Reuters) in Emerging Sources Citation Index, in Scopus beginning with vol. 1 in SCImago Journal & Country Rank, and listed in Cabell's Directory. Copyright © 1997-2018 by Differential Geometry and Geometric Structures. All rights reserved. Last modified on December 21, 2018.